The masses flooded into Churchill Downs on a beautiful day Saturday, smashing the attendance record for American racing’s biggest day. The reported attendance of 170,513 that turned out to see American Pharoah defeat Firing Line, Dortmund and 15 others easily broke the previous mark of 165,307 set in 2012 when I’ll Have Another was victorious. The crowd packed into every corner and crevice of Churchill’s grandstand, clubhouse, infield and luxury areas. They came to see the Derby and a loaded undercard, which featured six other stakes, and they were not disappointed. The Grade 3 Pat Day Mile Stakes – known as the Derby Trial for its first 90 runnings – led off the impressive schedule of graded stakes on the picture-perfect day. Fans erupted as the eight-horse field turned for home, as undefeated favorite Competitive Edge found another gear in the homestretch and kicked clear to win by 4 1/2 lengths under the guidance of John Velazquez. 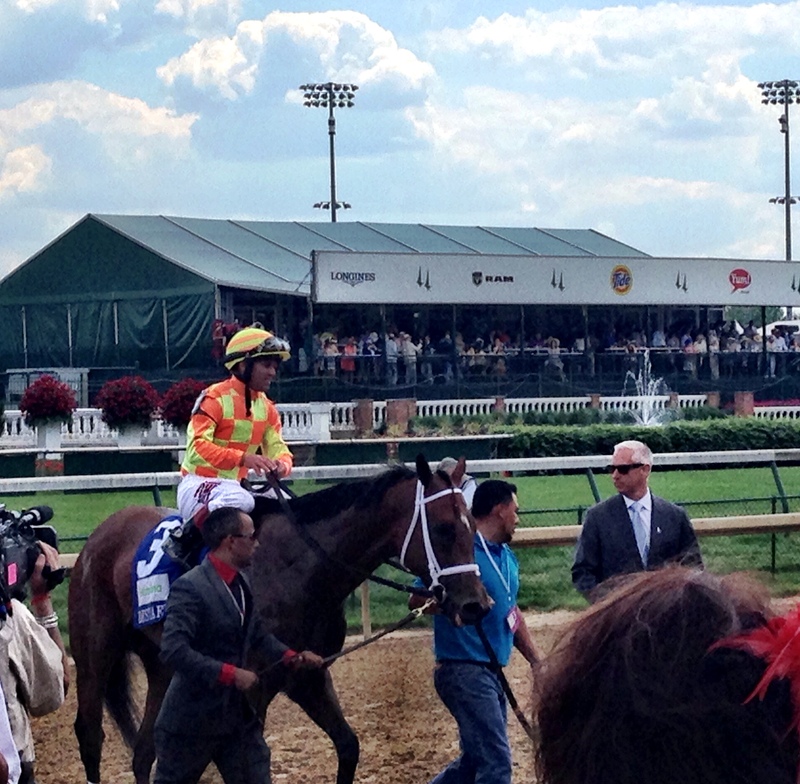 The victory marked the first win of the day for trainer Todd Pletcher, but it would not be his last. The Grade 2 American Turf Stakes, the first of three races contested on the Matt Winn Turf Course, followed the Pat Day. While there was no clear favorite in the race, the crowd still seemed surprised when 9-1 shot Divisidero and jockey Rafael Hernandez impressively sped past the majority of the field in the stretch, beating out 4-1 third choice A Lot by three-quarters of a length. Trainer William “Buff” Bradley was all smiles as he hugged family members in the newly renovated G. H. Mumm Winner’s Circle, celebrating his first graded win since two-time champion and Breeders’ Cup Filly and Mare Sprint winner Groupie Doll went into retirement early last year. Divisidero’s triumph was just the second graded stakes win for Hernandez, who moved his tack from Fairmount Park near St. Louis to Churchill last September. 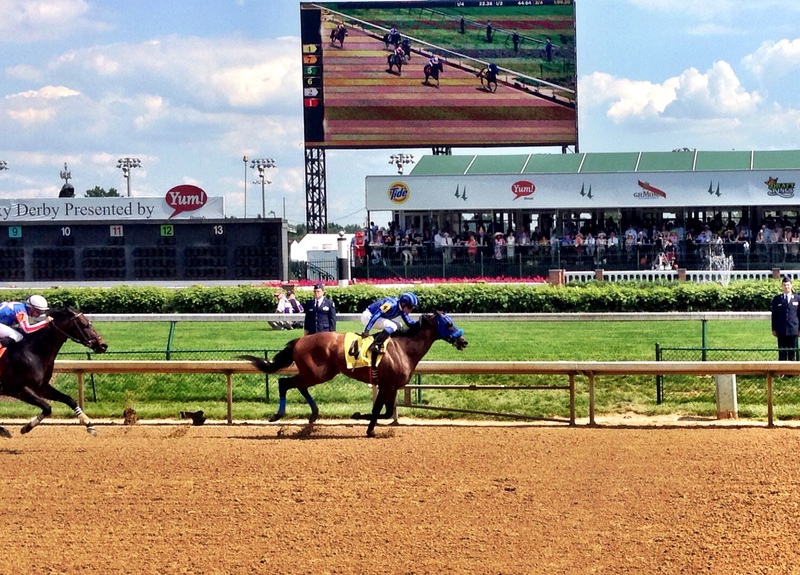 The seventh race and third stakes of the Derby-Day card marked the first Grade 1 event of the afternoon – the Humana Distaff. The masses continued to pile through the track’s historic gates, as 2014 champion female sprinter Judy the Beauty took to the main track as the even-money favorite. Coming off of a six-month layoff, Judy the Beauty sat right off leader Moonlit Stroll in the early stages, before making her move and taking the lead in the stretch. For a brief moment, it appeared Judy the Beauty would avenge her lone loss of 2014 when she finished fourth in last year’s edition of the Humana Distaff, but no one told Dame Dorothy. Dame Dorothy, under heavy encouragement from jockey Javier Castellano, put forth a phenomenal effort in the race’s closing stages to edge Judy the Beauty by a neck. 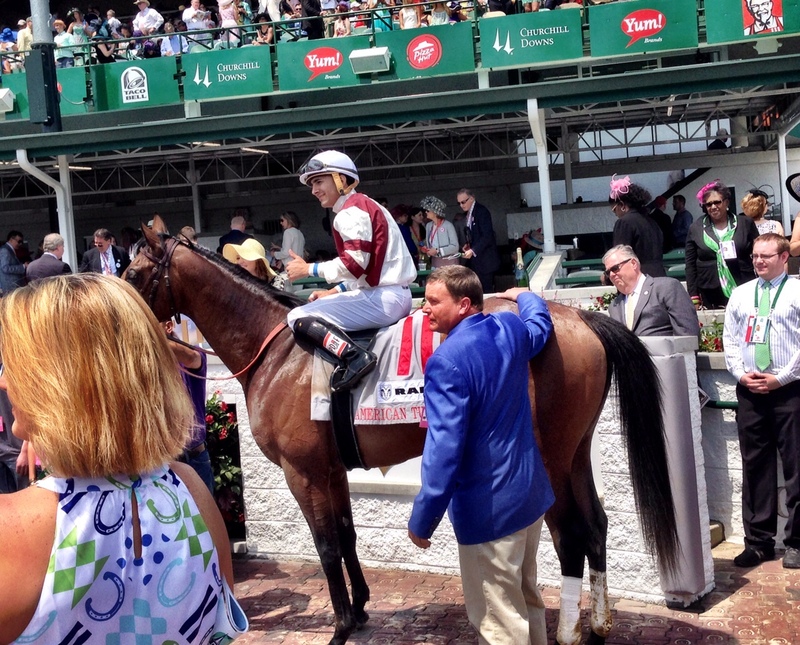 Trained by Pletcher, Dame Dorothy is owned by celebrity chef Bobby Flay. Although Flay was not on hand for the post-race photo, there was no shortage of celebration from the crowd, who at that point in the day was ready to cheer on anything. In the Grade 2 Churchill Distaff Turf Mile Stakes, jockey Julien Leparoux was able to get Tepin on the lead early and the Mark Casse-trainee never looked back, besting favorite Coffee Clique at the wire by 1 1/2 lengths. Coming off an allowance win in her first and only start of 2015, the Turf Mile victory was the first stakes win for Tepin since taking the Grade 3 Delta Downs Princess as a 2-year-old. When reigning Breeders’ Cup Classic winner Bayern made his way to the paddock for the Grade 2 Churchill Downs Stakes, a paparazzi swarm surrounded the Bob Baffert trainee every step of the way. They were disappointed a bit when 5-2 second choice Private Storm got off to an early lead and wired the field. Bayern finished sixth and last as the odds-on favorite. Ridden by Martin Pedroza for trainer Jorge Navarro, Private Zone collected his fifth stakes victory on U.S. soil. The race prior to the Kentucky Derby was the Grade 1 Woodford Reserve Turf Classic Stakes, where favorite Finnegan’s Wake went from dead last entering the final turn to surge past the field and beat out the subsequently disqualified Sky Captain by a head. The 6-year-old son of Powerscourt is trained by Peter Miller and was ridden by Victor Espinoza, who enjoyed a pretty good afternoon. The winner’s circle was flooded with the Donegal Racing colors of green and yellow, as the several partners packed in for the photo. 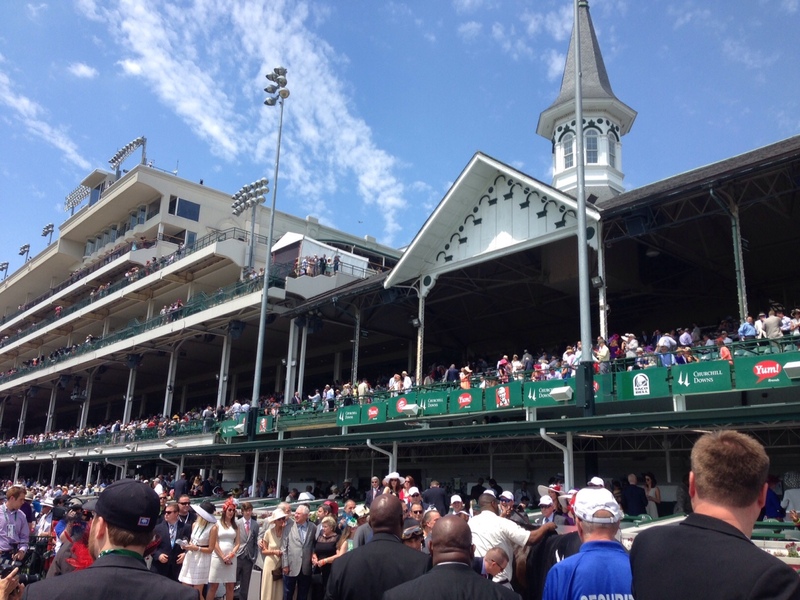 Derby Day Notes: Churchill Downs reported record all-sources wagering of $194.3 million on Derby Day, up 4 percent over last year’s total of $186.6 million and a 4 percent increase from the previous mark of $187 million in 2012. 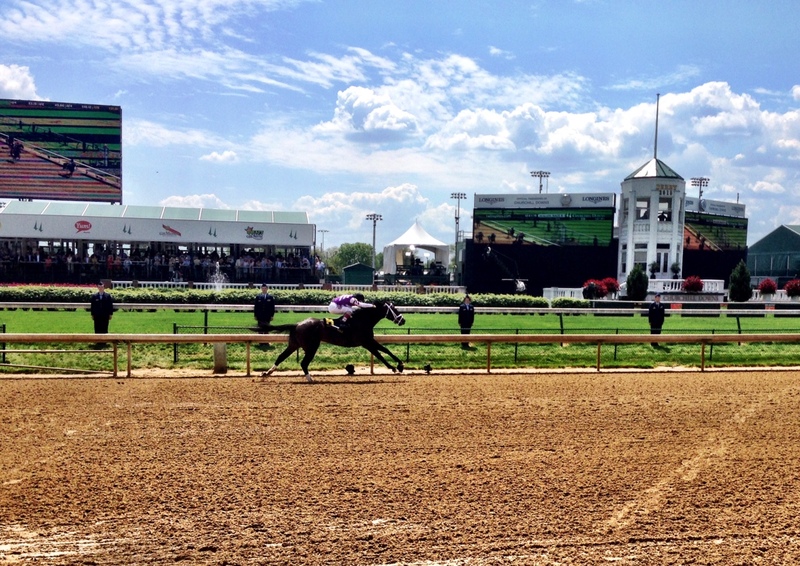 … A total of $137.9 million was bet on the Derby itself, up 7 percent from $129.2 million. … The day’s on-track handle showed a 2 percent decrease, from $23.4 million in 2014 to $23 million this year. … The day’s other winners were Paganol (first, allowance-optional), Island Town (second, allowance-optional), West Village (third, maiden), Agent Di Nozzo (fourth, allowance-optional), Paid Admission (12th, allowance-optional) and Bent On Bourbon (13th, maiden).